After getting rid of formulas I didn’t love, duplicate shades and colours I just wasn’t using enough I was left with a far more manageable edit. I ended up rehousing all of them in my muji drawers so I can easily see the shades and have access to them – I also grouped them into brands and colours, because that’s just the kind of person I am. 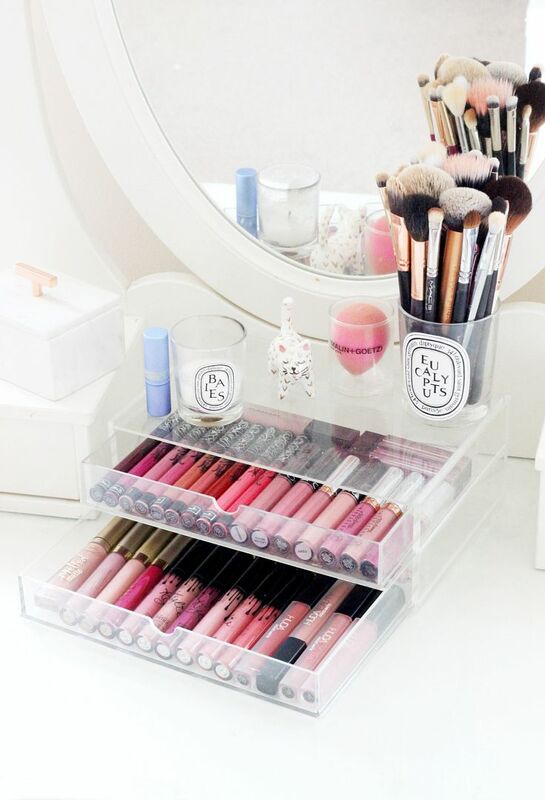 Having all the options in the clear drawers is a lovely pop of colour on my dressing table and the whole thing looks neat enough so that it doesn’t cluttery everything up. Although I know it’s a lot of liquid lipsticks still, I’m operating a one in, one out policy now which means it will stay looking pretty. I’ve been left with my favourite shades in my favourite brands – those would be Kat Von D, Ofra, Anastasia Beverley Hills, Stila, Kylie, Too Faced and Huda Beauty. What can I say, I need variety. I love every Kat Von D shade I try, and the formula is one of the best in how it doesn’t dry the lips but still stays smudge-proof for hours. My absolute favourite shade is Lovesick, which is a mauvey pink I can’t recommend enough. The Ofra formula has a mousse consistently and it’s one of the softest and easiest ones to wear. Anastasia Beverley Hills, Kylie and Too Faced are all fairly similar in terms of formula and none of them are especially creamy or forgiving on the lips but they’re the ones I reach for when I want a truly powdery finish. The Stila and the Huda are softer in terms of texture and they’re a lot more comfortable. Do you have any liquid lipstick favourites?